Forest Drive, Buxton Road, Elizabeth Drive, Dukes Avenue, Heath Drive, Orchard Drive, Baldocks Road, Purlieu Way, Harewood Hill, Woodland Way, Morgan Crescent & Green Glade. If we don't care for our village trees and look after them we may lose them, and they are one of the reasons that Theydon is such a lovely place to live. 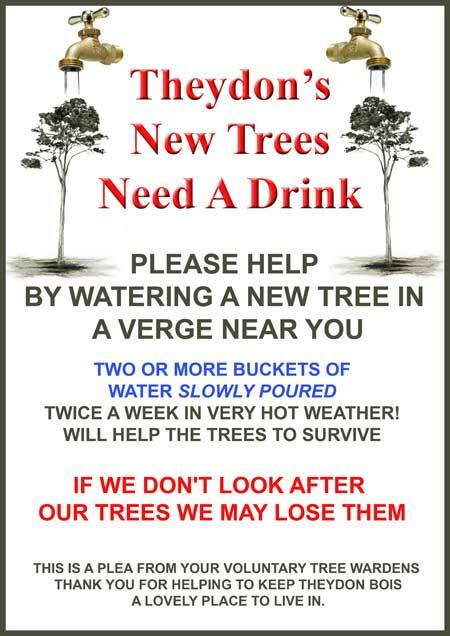 A big thank you in to all those already watering and those able to help from our Tree Wardens. Rain initially delayed the taking of Strawberry Cream Teas alfresco at the Theydon Bois Baptist Church this afternoon, but the sun soon shone again and visitors moved outside to enjoy views of our village green bathed in glorious sunshine. 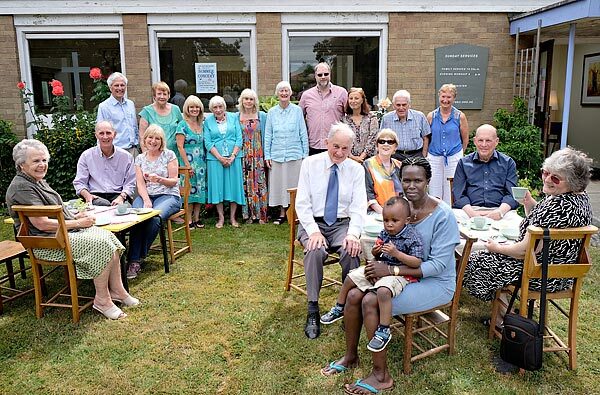 They also enjoyed the tea or coffee together with splendid home made cakes and scones baked by church volunteers. One of the reasons for the afternoon strawberry teas was that Open Gardens day, which is usually held on the last Sunday in June, was cancelled this year. The church posted notices at the Village Hall redirecting any visitors who were not aware of the cancellation so they could at least take tea by the green. Any donations that were made by visitors are being passed to 'The Box' in Epping. 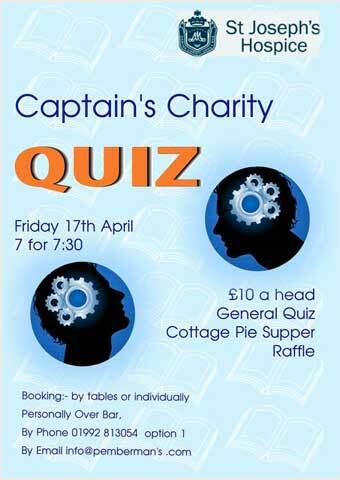 Rosie the assistant manager at The Bull is holding this event for charity. 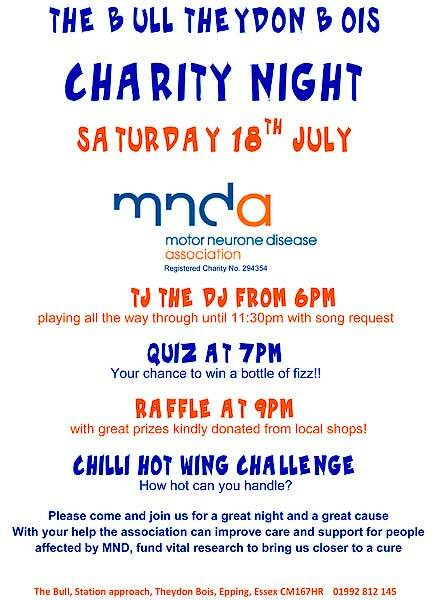 Starting at 6.00pm at The Bull on Saturday 18th July with a DJ. Rosie is rasing the money for Motor Neurone Disease Association, a cause that is very close to her heart and that she believes that more awareness needs to be made about this awful disease. Feel free to come along and meet your local Pcso and discuss any community issues or problems. Come and Join us, you talk we listen. 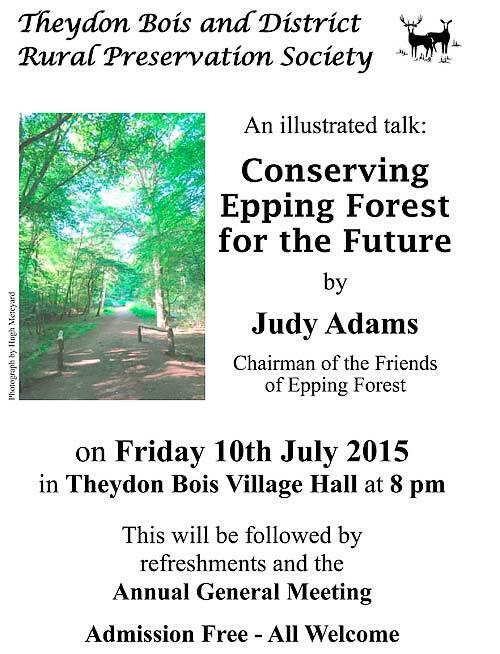 On Friday 10th July at 8.00 pm in the Village Hall there will be a free illustrated talk: Conserving Epping Forest by Judy Adams, Chairman of the Friends of Epping Forest. This will be followed by refreshments and the AGM which will start at approximately 9.00 pm. All are invited to attend. On Sunday July 12th starting at 2pm from our Village Hall TB&DRPS Committee Member and Theydon Bois Tree warden Robert Levene will lead a walk to see Theydon Wood and the open air Art Work visible from the M11 motorway. This is a free event and all are welcome. On Sunday September 27th starting at 2pm there will be the final walk of our 2015 season. "Towards Blunts Farm/Theydon Garnon way". Our 20th November Talk: Will be by Peter Warne. Peter continues to map the wildlife at Copped Hall on behalf of the Trust. There are new species to report and previously mentioned species with new stories. A new project is seeking out the moth population which involves setting up night light traps and early starts to see what has been caught. This talk is free and again all are welcome. Further details of all the the Society's walks and events can be found on their website page. There will be a Local community Meeting Held in Abridge Village Hall on the 24th August 2015 at 7.30pm. Everyone is welcome to come and discuss any local issues. Crime figures will be made available for the area and local priorities will be set for the next month. Areas covered by the meeting are Abridge, Epping,Thornwood, North Weald, Coopersale, Theydon Bois, Stapleford Abbotts and surrounding Village. The meeting will be run by Essex Police and will be attended by the local Police Constable,Sergeant and Inspector. Theydon has quite a number of regular horse riders and Essex Police are calling on horse riders to join the volunteer Active Citizen scheme and help to provide an extra set of eyes and ears and report any problems into the police. The Active Citizen scheme seeks members of local communities to provide a visible presence whilst out and about, keep an eye out for any problems particularly in rural areas, and report any suspicious activity to Essex Police, as well as engaging others in the community to do the same. Successful Active Citizen schemes are already up and running in Colchester and Billericay, however it is hoped that this scheme will encourage local horseriders who take routes across the county’s rural areas to further complement this work by keeping alert and reporting anything suspicious to us on 101. Volunteers will be provided with a hi-visibility armband to identify that they are part of the initiative. If you are an experienced horserider and over the age of eighteen, we would like to hear from you. For further information, please contact Sgt Cathy Calder on 3114@essex.pnn.police.uk. Theydon Bois is not alone in having problems with our refuse collections since the recent changes. These changes to waste and recycling leading to significant problems with kerbside collections must improve according to EFDC Cabinet Portfolio Holder Councillor Will Breare-Hall. In a statement to Cabinet on 11 June 2015, Councillor Breare-Hall outlined a list of different problems and steps being taken to get the service improved. 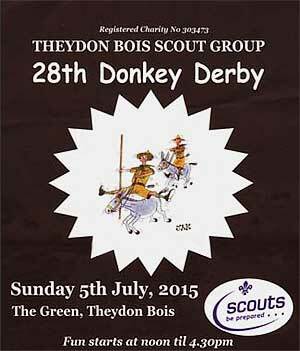 AND they are off - the Theydon Bois Donkey Derby is under starters orders for this year. The annual event on the village green will be held on Sunday July 5th. There will be seven races in the derby, with children aged 10 to 15 trying to get their mules around the course in one piece. Punters can bet on the donkeys for fun with a payout for the winners in each race. 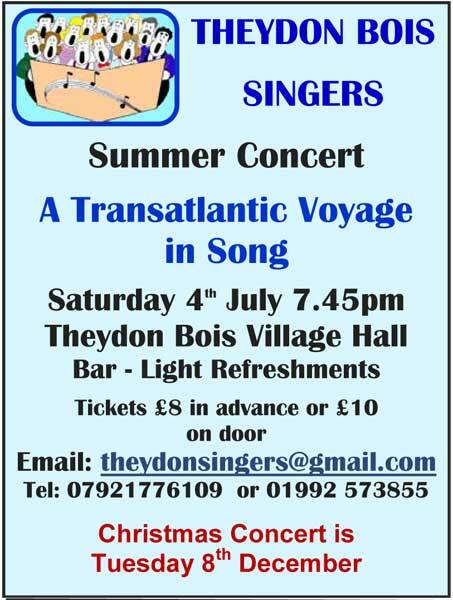 The event is run by the Theydon Bois scout group and sponsored by local estate agents Stevenettes and raises money for scouting and guiding groups in the area. There will also be a huge variety of stalls at the event which attracts about 4,000 people each year, such as hook the duck, smash the crocks and a penalty shootout. As well as food, refreshments and side shows there will also be an old-fashioned helper skelter, swing boats, a big wheel and a fair ride for younger children. As well as the races, there will also be a fun family dog show run by Homeward Hounds who will have a small agility course for people to try their dogs out on. And before the derby starts there will be children's races for them to compete in and also a scout-versus-guide challenge later in the afternoon. Entry is free to the derby, which starts at 12pm until 4pm, though programmes will be sold for £1 on the gates. To be a jockey, children need to be aged 10 to 15 and weight less than 50kg (seven-and a-half stone) please call Andy Bowles on 01992 813772 to register beforehand or you can sign up on the day at the PA van. To donate bric-a-brac or crockery for smash the crocks, please call Bob Penman on 01992 813709 to arrange for collection. Many of you will already have noticed that the large horse chestnut tree near the Green has been removed. 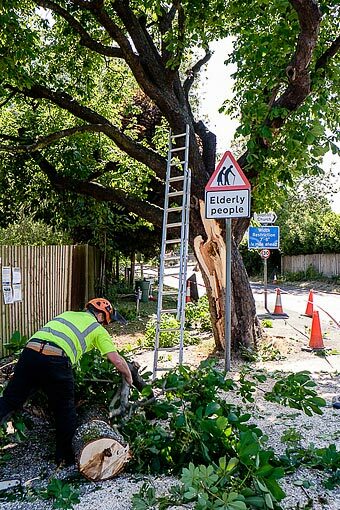 Unfortunately a large section of this large tree split this and George Hayley and his team responded within about half an hour of tree warden Robert Levene reporting this the problem to EFDC on the afternoon of Thursday 4th June. 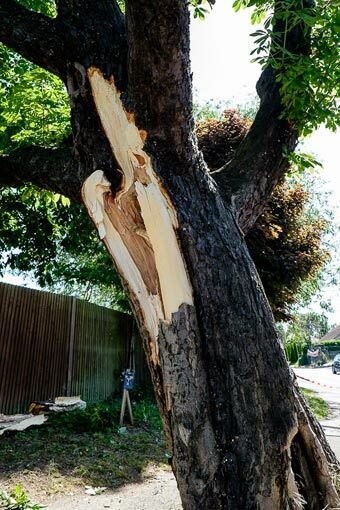 When our tree wardens and the EFDC team looked at the tree they saw that the branch that split from the main truck had left a large scar and had also badly stressed the rest of the truck, clearly splitting it very badly, making the whole tree unstable and dangerous. Therefore, there is no choice but to remove this iconic tree, which has been a feature of the village for many generations. The EFDC tree team had been trying for many years to extend its life, as even to the casual observer the hole in its central core had been getting bigger and bigger over the last few years. The actual timber, was very dry, with little raising sap, reminding us the importance of watering our new street trees till they get established. EFDC are hoping that if they can remove the old trees roots and re mulch they will be able to plant a replacement Horse Chestnut. Unfortunately near the opposite this corner (with the well identified parking problems) on the green, one of our 'New Avenue of Oak' trees was badly damaged by a car hitting it. This end tree of the new Avenue of Oaks is also unfortunately not going to survive, and THe City of London, having inspected within 24 hours of the tree wardens reporting it, agreed to replace this tree with a new Oak. 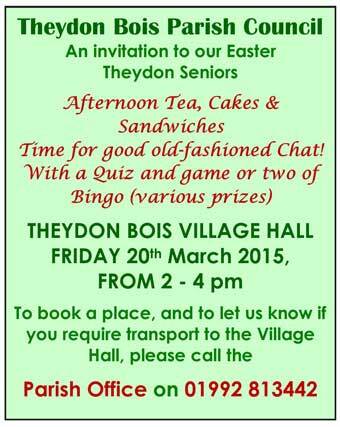 Theydon Bois is indeed fortunate to have such excellent service from both EFDC & THe City. ROLL up, roll up - the circus is coming! Theydon Bois Primary School will be holding a circus for the first time in its history. 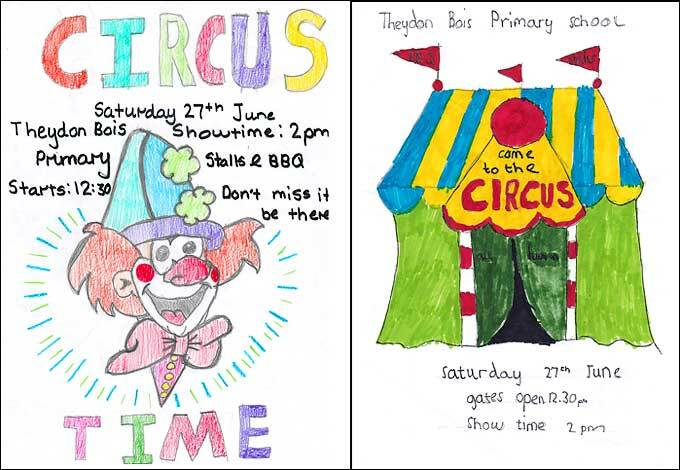 The PTA have organised the event and Happy's Circus will be rolling onto their playing field for the show in a big top on Saturday June 27th. Gates will open at 12.30pm and for a barbecue beforehand. 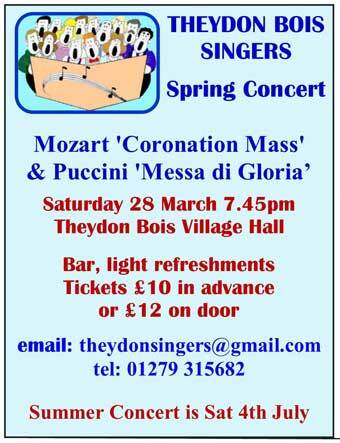 There will also be refreshments and stalls to keep everyone busy before the show begins at 2pm. The PTA is desperately trying to raise enough money to replace the school's dilapidated swimming pool changing rooms so please come and spend your pennies. Happy's Circus will be bringing their own bigtop along with acrobats and clowns etc, but no performing animals. Event organiser, Zoe Souber, said: "We are really excited to have the circus coming to Theydon as it has been two years in the planning. We hope it will be a really fun event for the whole family to enjoy." The schoolchildren also designed posters (above) for the event. The two joint winners were Connor Bourke in Year 5 and Richard Bass in Year 3. 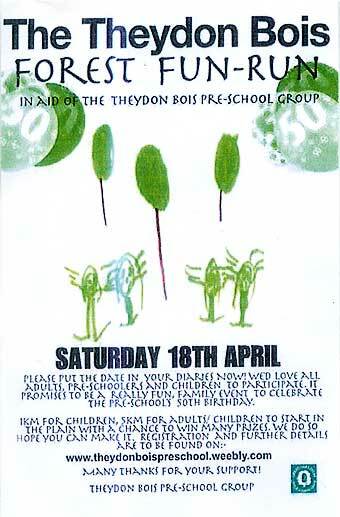 Unfortunately, Theydon Youth had to make the decision to cancel this year’s Open Gardens’ Day. The number of Gardens wishing to open this year was not enough for us to host the event. 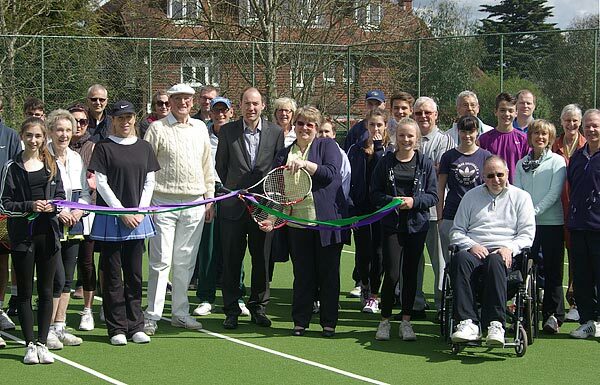 In the last five years Open Gardens’ Day has raised almost £20,000 for Theydon Youth and we would like to thank everyone involved for their time and efforts both this year and or in previous years. We are hopeful that we may be able to drum up support to enable us to open next year. Club night continues to grow with both the weekly night and Junior Monthly night having a turnout of over 30 children. Michele Hinton has agreed to take over from Thea Buisson as Youth Leader for the Junior Night. Both Michele and Thea have recently completed (and passed) First Aid and Safeguarding training. In April some of our members took part in a ‘Wet’ Activity Day and Stubbers Adventure Centre. 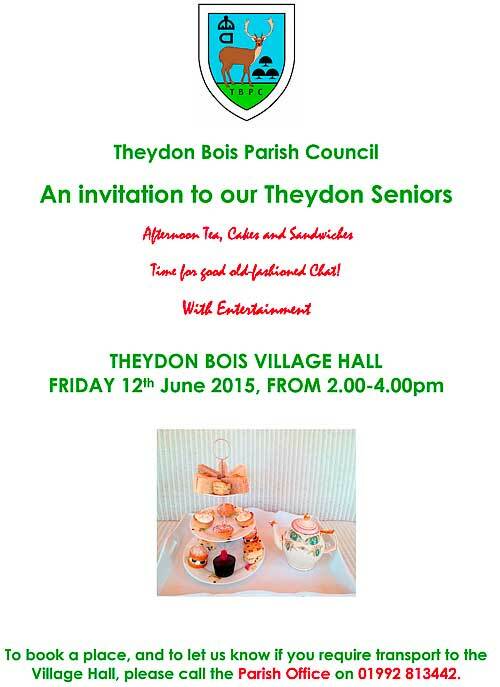 The day was organised by the Essex Boys & Girls Club and was funded by Theydon Youth. 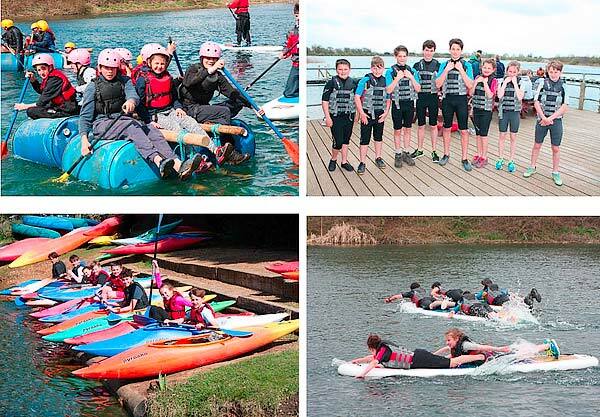 Activities included canoeing, raft building, paddle boarding and banana boats rides. A great day was had by all and another day has been planned for the end of June. The lighter evenings mean that we are able to use the outside area and we would like to thank Theydon Bois Cricket Club for their help in maintaining the grounds. We are always grateful of extra help so if you think you could spare a couple of hours each month the please get in touch. We are also happy to welcome new members. Tuesday night runs from 7-9pm during term time and is for Year 6 and up, Junior night is on the last Wednesday of the month during term time and is from 6.30 till 8pm for Ages 8-10. 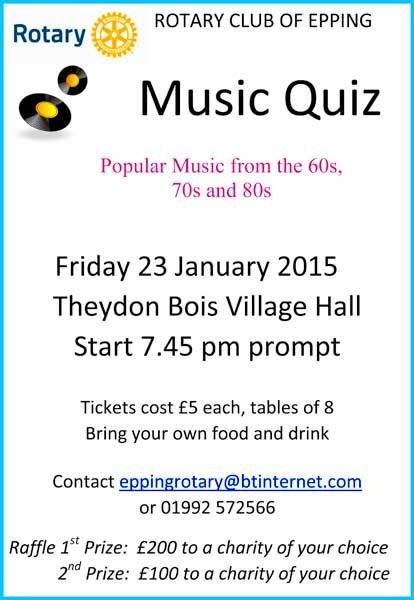 Please contact Thea Buisson – 01992 815982 / theydonyouth@hotmail.com with any enquiries. 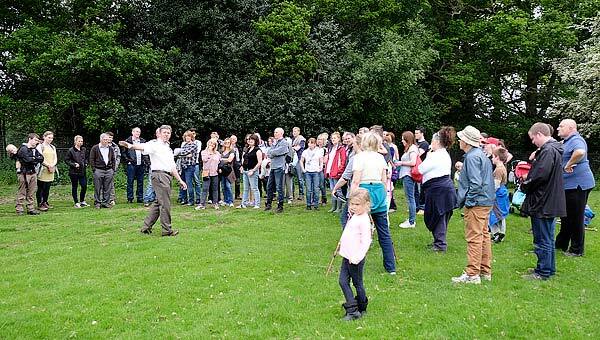 More than 80 adults and children attended last Sunday's (24th May) Theydon Bois & District Rural Preservation Society's walk from the Village Hall. This was led by committee member Martin Boyle and included a visit to the to Deer Sanctuary where Forest Keeper Michael Collins explained the purpose of the sanctuary and its history. 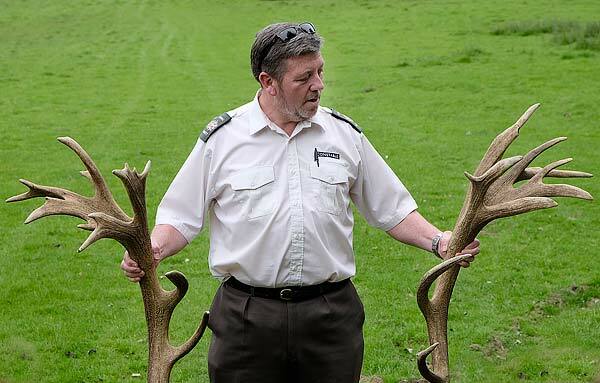 Michael gave information on the approximately 130 special black back fallow deer that inhabit the sanctuary and talked and answered questions about all species of British Deer and Epping Forest wildlife. The children present were particularly impressed with the antlers passed around by Michael including some large Red Deer antlers from the herd kept at Woburn Abbey. This was the 4th year that TB&DRPS has managed to arrange a Deer Sanctuary walk and visit with this year walkers including people from as far as London, Bishops Stortford and Romford as well as those more local. It is hopped that the Society will be able to visit the Sanctuary again in May 2016. The Society's next walk will be on Sunday 14th of June at 2.00pm from the Village Hall and will be “A tour of the Winning Trees” Tree winners from the 2014 'Landscape Tree Competition'. 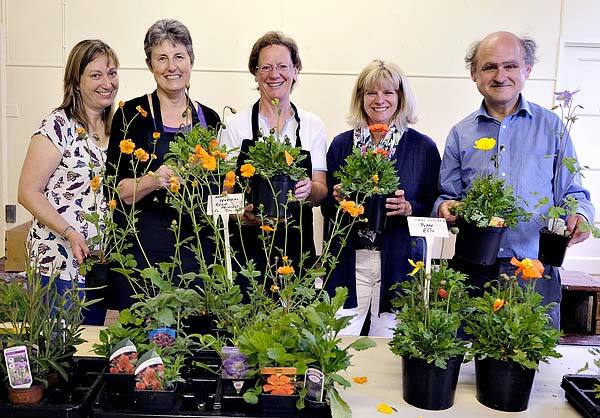 Last Saturday a touch of Chelsea Flower Show came to Theydon Bois with the St Mary's annual Plant Sale at the Church Hall. Business was brisk as villagers took the opportunity to stock up their beds, borders, pots and hanging baskets ready for the Bank Holiday weekend. Cottage garden favourites such as lupins and peonies proved very popular and quickly sold out but also available were bedding plants, runner beans, tomato plants and more unusual perennials for those looking for something different. Delicious home made cakes were also on offer from the usual catering corps in the kitchen! The organisers were delighted with the number of sales and also to see so many locals supporting the event which has become a regular in the village calendar. There is a rare opportunity to view what is probably the largest map of Epping Forest when for one day only a 30ft foot long 1882 map of the forest is being exhibited. On Saturday 4th July this map from the Essex Record Office collection will be on display at Loughton Library, Traps Hill, Loughton. 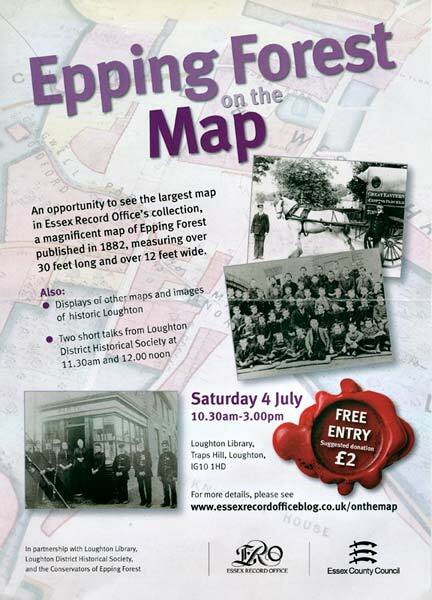 There also be displays of other maps and two short talks by Loughton and District Historical Society. Theydon Newsdesk, this website and Village News, is run entirely by volunteers and at no cost to our Parish Council or rate payers thanks to the generous support of our sponsors. This sponsorship covered all our production costs until recently when some Theydon Businesses closed or ended their previous sponsorship. We are glad to report that we have found new sponsors to replace them and welcome Woodland Care Home of Loughton, M & K Cleaning Services of Loughton and Greens Traditional Butchers in Coppice Row as our new sponsors. 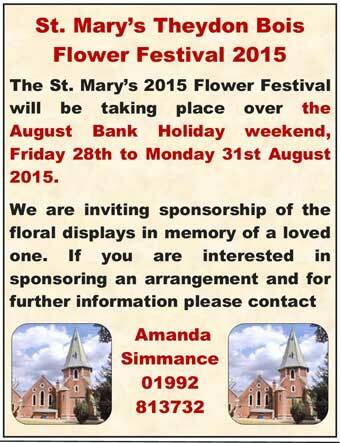 Please give them your support and mention Village News and Website when using their services. Their details can be found on our Sponsors Page and links to their websites are available from our Links Page or our Shops Page. 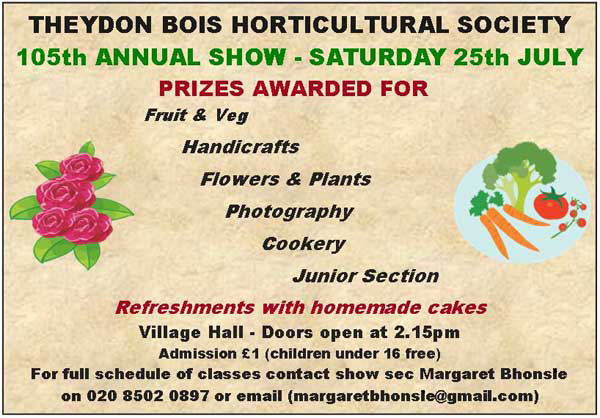 Unfortunately there will be no Open Gardens Day in Theydon Bois in 2015 as the committee were unable to find sufficient gardens that were prepared to be open this year. 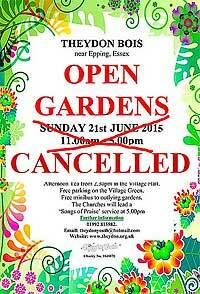 It is hoped that Open Gardens Day will return in 2016. Open Gardens Day has been run for the last 34 years usually on the last Sunday in June. A total of 49,417 votes were cast. The turnout was 67.3 per cent, 3.2 per cent higher than in 2010 and the highest since the 72.8 per cent at the 1997 general election. Any discrepancy between the total number of votes cast and the ballot papers issued is agreed with agents at the count, prior to the declaration of the result. Epping Forest MP Eleanor Laing has retained her seat winning her fifth general election with an increased 17,978 vote majority. For the fourth year a special event has been organised by Theydon Bois Rural Preservation Society for 2pm on Sunday 24th May to visit the Deer Sanctuary which is located within the village boundary. Many residents do not realise that Theydon Bois is almost unique in having a near 100 acre Deer Sanctuary so close to its houses. Access, until recently was rare and is still only occasionally agreed by the City of London who administer the Deer Sanctuary as part of its management of Epping Forest. Martin Boyle, a Committee member of the Rural Preservation Society, will lead everyone interested from the Village Hall, leaving strictly at 2pm, on a gentle walk which is suitable for anyone able to walk 1 mile plus and includes children and buggies, but sorry no dogs. The following persons are nominated for election as a Member of Parliament for the Epping Forest Constituency. The Election Date is Thursday 7th May and the Polling Station for Theydon Bois is St. Mary's Church Hall in Coppice Row. 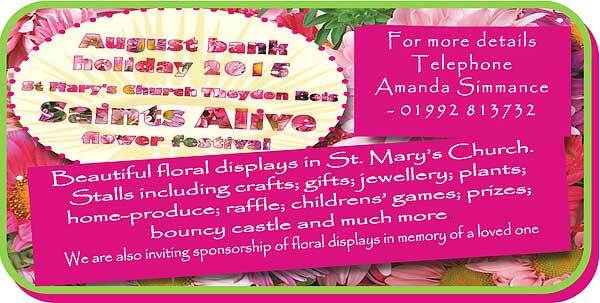 THE Playground At Theydon will be holding a Spring Fair with lots of activities for children of all ages to enjoy. There will be a pets corner, Farmer PAT's animal hunt, face painting, lucky dip, games and crafts and activities at the play park on the corner of Green Glade and Poplar Row in Theydon Bois. 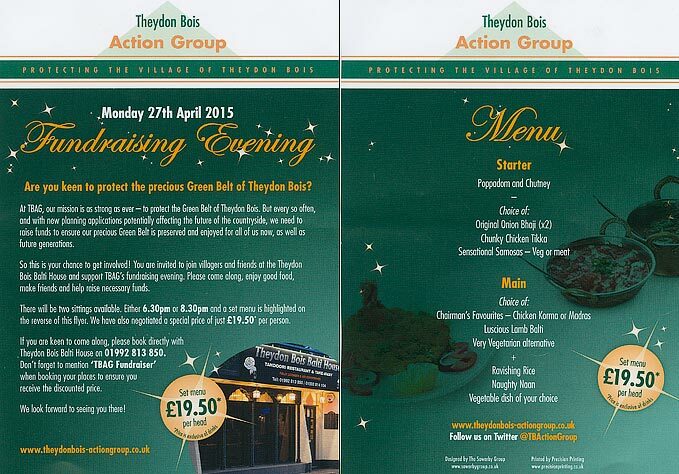 Theydon Bois Action Group (TBAG) are holding a fund raising Curry Evening at the Theydon Bois Balti House on Monday 27th April. There are two sittings for a set meal, 6.30pm & 8.30pm at £19.50 a head. At the Ceremony, club member, stalwart and volunteer, Les Snellin was also made a Vice President in recognition of his voluntary work at the club. EFDC have produced a new map showing trees in and around Theydon Bois Parish that have had tree Preservation Orders applied to them as of March 2015. A Tree Preservation Order (TPO) is a legal order made by the local planning authority (LPA). When applied it is, except in special circumstances, for example if it has become particularly dangerous, illegal for anyone to damage or to fell a protected tree without first having been given consent. The same restriction even applies to pruning. EFDC choose to protect trees, often on development sites, where they are under threat and which they judge to be important local assets. In the TPO preserved trees are shown as individuals or in groups, areas or woodlands. The map is available to download as a pdf here and further information is available on our Tree Strategy Pages. Can you knit or crochet? If not, would you like to learn? Come along to the back room of St. Mary's Church Hall (follow the signs to the back door, to avoid the main hall) on the 1st & 3rd Wednesdays in the month, from 1.30pm - 3.00pm, and join our new group (babies and toddlers are welcome). The charge will be £2.00 a session including a drink and biscuit. If you can knit or crochet already, please come along and pass on your skills. For more details phone Linda on 01992 814177. Violet and George Dabbs celebrated their 60 Wedding Anniversary yesterday in the 'Themed Cafe' at Frank Foster House with a party for their friends and family. 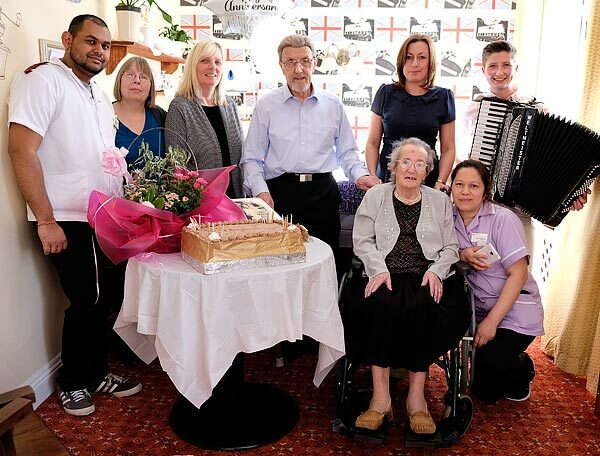 Music and assistance was provided by the Runwood Homes staff who also presented the couple with flowers and an additional cake. George 84 still lives in the family home in Harlow and Violet 82 has been at Frank Foster for the last year. 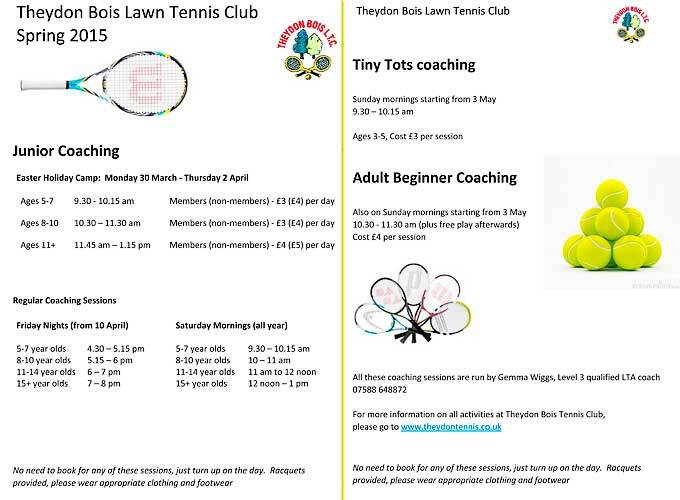 Theydon Bois Tennis Club are starting a new round of coaching sessions this spring beginning with a Junior Coaching 'Easter Holiday Camp' starting Monday 30th March. Throughout the spring and into the summer coaching will available to members and non members aged from 3 year old 'Tiny Tots' up to all adult ages. There is no need to book these sessions, just turn up on the day. Details are below with further information on the club available from their website. As promised below Loughton Astronomical Society members turned out to watch today's solar eclipse from below the village sign near the Bull. Unfortunately it was not to be as heavy cloud cover prevented any views from Theydon and most of the South East. 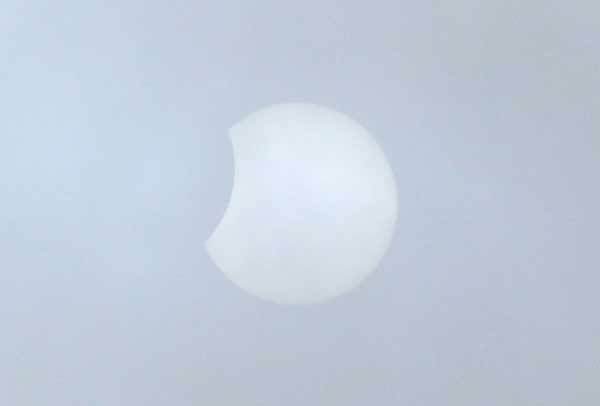 At the maximum point of coverage at 9.30 am there was perhaps a slight darkening of the sky, but it was impossible to note any other effects. Members were forced to just talk and receive photos from other societies in different parts of the country, Nottingham observers seemed to have good views, or watch the TV coverage on their mobile phones. 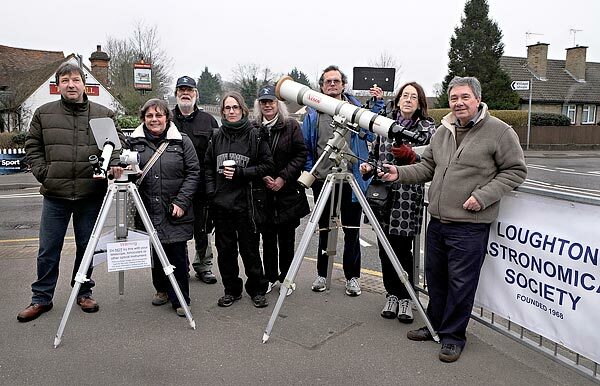 Still all was not entirely lost as it was a good opportunity for LAS members to talk about the eclipse and astronomy in general with passing villagers and promote the society. 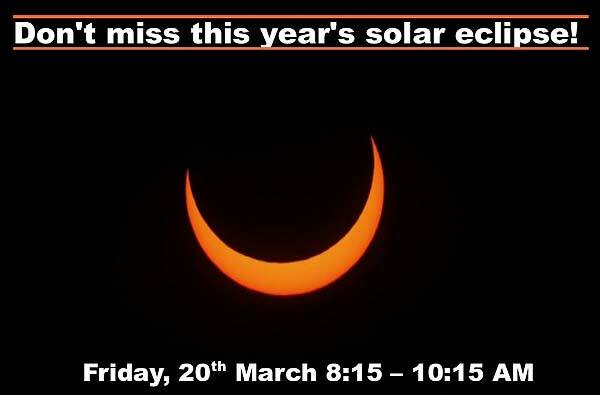 The Loughton Astronomical Society will be observing the eclipse in Theydon Bois Friday morning, if clear. If it is raining or totally overcast they will probably be in Belgique waiting. 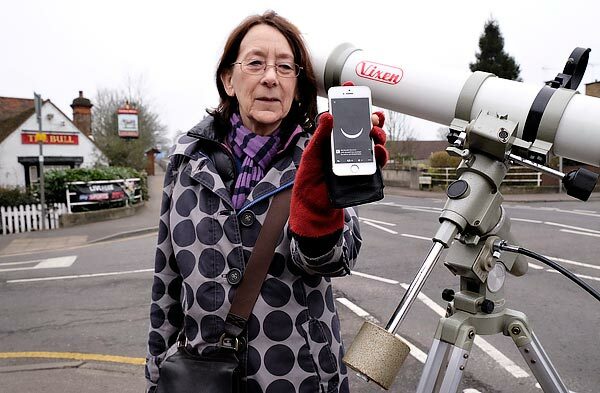 They plan to set up special telescopes to view the sun safely near the village sign outside Greens Butchers, from around 8:30 to 10:15. This will catch late commuters and shoppers. They meet every Thursday in the Scout Hut off Loughton Lane and welcome all levels of experience. 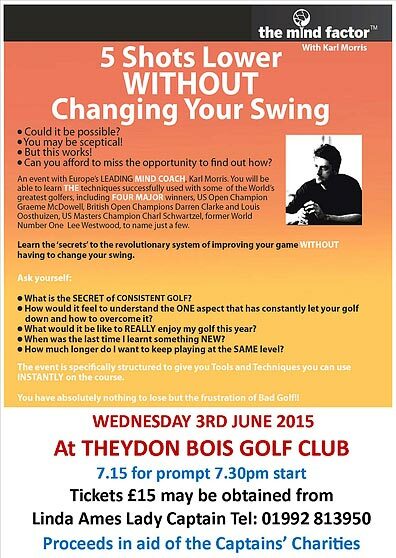 If you are serious, curious, want to learn or just fill an evening then come along. For their younger observers (6-14 years) they have a junior section that meets monthly. Last Friday all the AstroKyds constructed pinhole cameras to view the eclipse. Epping Forest MP Eleanor Laing has praised the efforts of three Davenant Foundation School students who have earned sporting and community recognition. Mrs Laing congratulated the achievements of James Lingfield, Marissa Sims and Daniel Rowden when she visited the school last Friday. * Daniel Rowden was a runner-up in Epping Forest District Council's Young Citizen of the Year awards when he was recognised for his involvement with his church where he uses his ability as a mentor to encourage younger people to reach their own potential. As a role model at Davenant, in church or on the track, Daniel was described as "a shining example of why being positive is so important". Daniel, 17, was also presented with a £1,000 district council Sports Bursary award. A 400m and 800m runner, Daniel is second in the UK 800m rankings after a host of successes which include the English Schools Championships and the Schools Internationals. * James Lingfield was named runner-up in the Lions Club International's Young Ambassador of the 21st Century awards for his contribution to the school's Boccia team and his charity work which has seen him raise money for various local causes. James. 15, gave the £100 he received as the winner of the 2014 Epping Forest District Council Young Citizen of the Year award to Loughton Foodbank. He has also raised money for the Chigwell Riding Trust where he has ridden every week since he was four years old. A couple of years ago James raised £400 for the charity when he walked a mile. As part of his prize James - who was one of the youngest nominations for the award - will be helping to crew a tall ship around Great Britain in summer 2016. * Marissa Sims won the English Athletics Championships Under-15 indoor 60m hurdles at Sheffield clocking a time of 8.99secs. Year 9 student Marissa is a member of Enfield and Haringey Athletics Club. She trains three times a week at Lea Valley Athletics Club and takes part in competitions about once a fortnight. Now she is setting her sights on qualifying for the 75m outdoor event at the English Schools Championships. 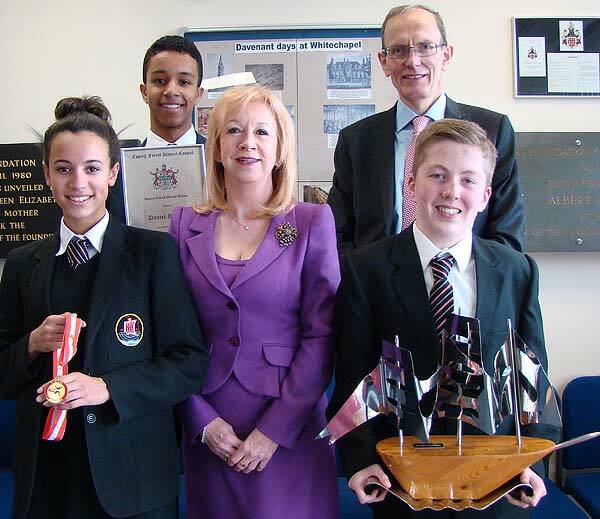 Mrs Laing said: "I was delighted to meet Daniel, Marissa and James who are excellent role models for their school. “They are truly inspirational young people and I congratulate them all on their achievements." A sign of approaching Easter (and hopefully Spring) is the start of a series of six 2015 Lent Soup Lunches organised by members of St Mary’s Church and held in the Church Hall. For the modest sum of five pounds, an excellent soup lunch prepared by the ladies of the Church, with the help of a few men also, can be enjoyed together with dessert and coffee/tea. Liz Hannibal explained that the Fair Trade Charity was being supported this year and drew attention to a display of Fair Trade items which could be purchased from local stores. The attendance at the first three lunches has been very high keeping the team of volunteers very busy. The proceeds of this first two lunches has raised over £700 and it is hoped that similar amounts would be realised from the other lunches which would then be donated to various charities supported by the Church including the Manna Centre and Missions for Seaman. On Saturday 7th February (7pm for 7.30pm start) St Mary’s Church are holding a “Spice” event at the Church Hall. Kalpna Kadri is a traditional Indian cook who will provide us with a fun cookery demonstration – we will then get to eat her efforts in a shared meal. The cost is £15 per head which includes poppadums, a starter and main course with rice as well as the demonstration. BYO alcohol/soft drinks/desserts. 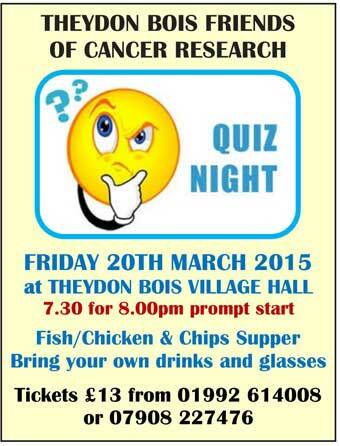 We will also be holding a raffle as part of the evening. Why not get together a gang of friends and make a night of it? Individual or group tickets on sale now (limited number). 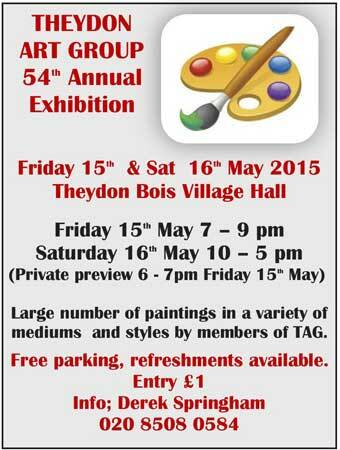 Contact Fiona Sagoo 01992 812328 soon to avoid disappointment! 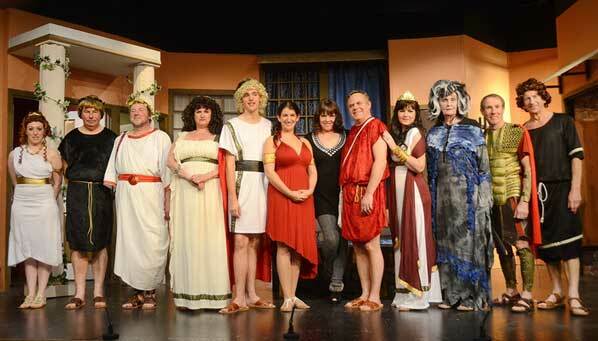 The last night of Theydon Bois Drama Society's production of “Up Pompeii” by Miles Tredinnick staged in the Village Hall was the usual sell out. 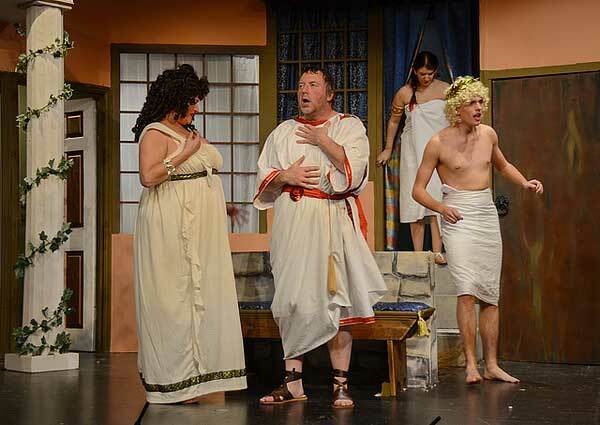 This hilarious romp through ancient Rome, with characters devised by Talbot Rothwell and Sid Colin for the BBC comedy series, was almost faithfully replicated by the cast even though lacking a Frankie Howerd in all his ribald dominance. Such was the standard of the performance that the Society had taken the wise precaution of warning in advance that “the production contains adult humour and is not suitable for children”, in other words it was almost on a par with typical Saturday night TV ! 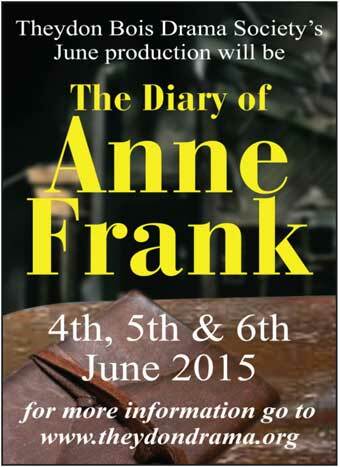 Angie Becket - Franks was the producer of this enjoyable production. The Society's next production runs in the Village Hall from March 11th - 14th and is The Lady Killers by Graham Linehan. This black comedy made famous by the Ealing Comedy film is sure to be another sell out so early booking is advised. Tickets are available from Monday 16th February and cost £8.50. Telephone: 01992 812250. 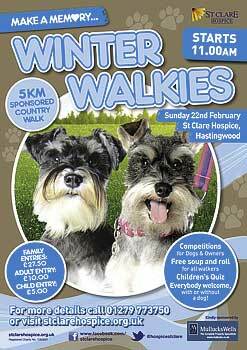 Perfect pooches Peanut and Daisy will be taking the lead when St Clare Hospice holds its popular Winter Walkies on Sunday, February 22nd. 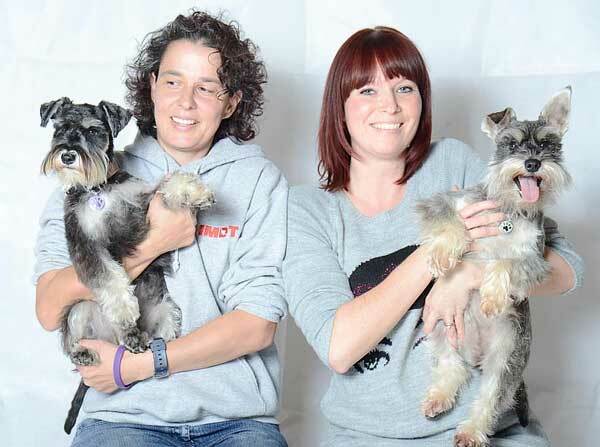 The cute canines are the furry faces of this year’s fundraising event after they won a Facebook competition to find a top dog to star on the Hastingwood-based charity’s posters, leaflets and other promotional material in the run up to the sponsored 5km countryside walk. From beagles and boxers, to collies and Cocker spaniels, almost 90 handsome hounds and pretty pups entered our online competition, with both Peanut and Daisy winning more than 300 votes each! Peanut and Daisy will be setting off at the head of our Winter Walkies pack when the pooch parade leaves the Hospice at 11am. Anyone can join the walk whether you are a pet owner or not. On the morning there will be doggy-friendly fun and games for all the family, including competitions for dogs and owners as well as a children’s quiz. Free soup and a roll for all walkers will also be available along with other hot refreshments on sale. Registration for Winter Walkies is £10 for adults, £5 for children or £27.50 for two adults and two children. For more information, call the St Clare fundraising team on 01279 773750, email fund@stclarehospice.org.uk or visit www.stclarehospice.org.uk.